So I trade out Watson. I decide S.Johnson is going to go so big against the Saints that he will get his BE. I bring him in; he’s going to go so big I make him captain. I’ve got Beams as well. I decide to hold Polec and Hallahan on the bench even though they are not playing. What could possibly go wrong? Anyway enough about my trauma, let’s look at where the points fell last round. As the following graph shows the total amount of points available was slightly less than average. But at least it was better than the previous week. There were above average hundreds scored. 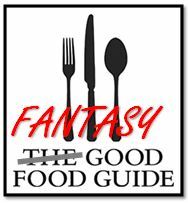 So many fantasy coaches had good scores. Although others were effected by donuts or various bad scores from premium players. Richmond scored 330 fantasy points more than Freo, but didn’t look like winning the game. 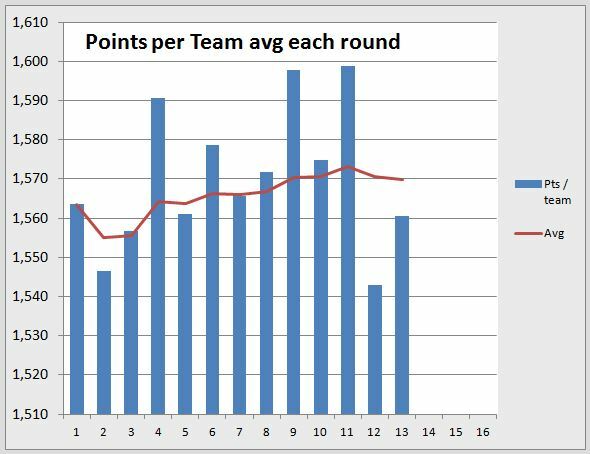 Geelong got 60% of the points in their game, 620 more than St.Kilda who had the 3rd lowest team total of the year. [Warning to fellow SJ captainers: don’t start thinking about what he would have scored if he played]. Fremantle lasted only 1 week in the green group, and fell back to middle of the table. Collingwood and Geelong moved into the green group, Fremantle and North Melbourne came out. 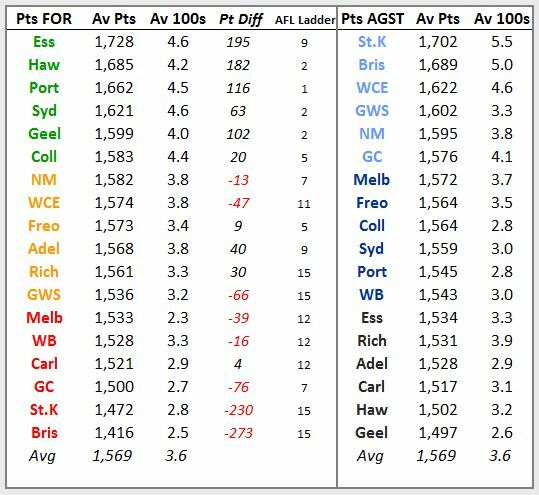 Essendon, Fremantle and Gold Coast are the teams whose points are most different to their AFL ladder position. 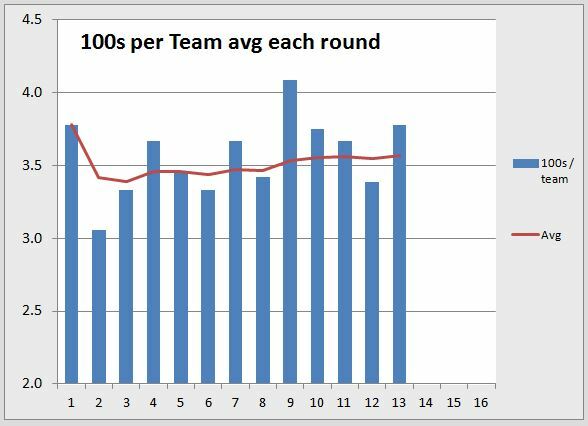 Hawthorn, Port and Sydney, Geelong, and Collingwood are solid at head of table, and well represented in many fantasy teams. Brisbane and St.Kilda remain at the bottom. 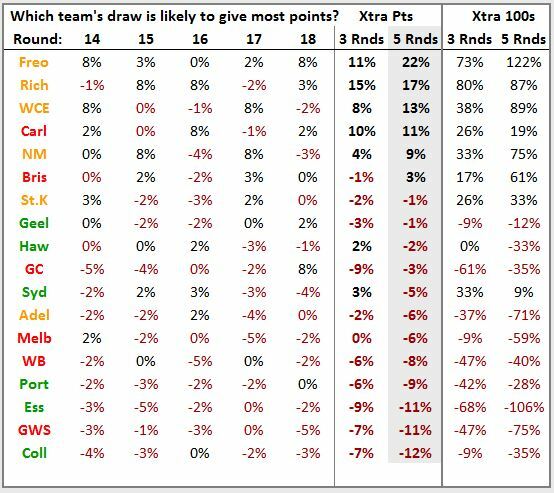 St.Kilda and Brisbane still concede most points, and over 5 hundreds a game. West Coast, GWS and North are the next 3. Carlton, Hawthon and Geelong are the least generous teams. All the highest scoring teams (green teams) are in the bottom half of the table. Port, Essendon and Collingwood are at the very bottom. Freo, Richmond, North and West Coast have the best runs. Collingwood is still at the bottom of the table. Richmond, North, Geelong, Hawthorn and Sydney are best placed of the teams with a lot of fantasy relevant players. For the extended analysis for the rest of the year and the finals see the table below. Adelaide is at the top with the best percentages of any team. Collingwood, Bulldogs, Geelong, Essendon and Sydney are all in the upper middle part of the table. This is good news for coaches as a lot of fantasy relevant players come from these teams. Port, North, Freo and Hawthorn are towards the bottom; this may be a concern for some coaches. One of the reasons I risked no midfield cover last round was because I wanted to get Stephan Martin as soon as possible. I haven’t heard it mentioned elsewhere but when Martin was at Melbourne a couple of years ago he was called on to be sole ruck for a long spell when their main rucks (Jamar et al) were all injured. He did very well averaging over 90 pts for most of the season. He likes playing sole ruck and just keeps getting into the game. Brisbane aren’t going to win games and no one is going to worry about Martin running around picking up fantasy points as he isn’t going to turn the game. His scoring held up against Mumford last week so I think he will keep scoring well against any opposition team ruck. Hey Nix, great stats article as always! Just quickly, which trade option should I do? great article nix, as u’ve stated u believe that stefan martin will be a top 6 forward playing as the sole ruckman, should we be worried about berger coming back in a few weeks? I think for fantasy he’s a good trade but RDT might not be the best keeping in mind berger may return before the end of the season? Well yes Berger return would be a risk. But reports say he will be out till R19. Then with his knee injury and time out I think they will start him in reserves and with limited game time. By then Martin should be valuable enough to sell or just move to Ruck bench. Yes in limited trade games such as RDT this is more of a risk. But you also have the benefit of 2 lookies without any price move yet so Martin should be cheaper in RDT. Cheers Nix. 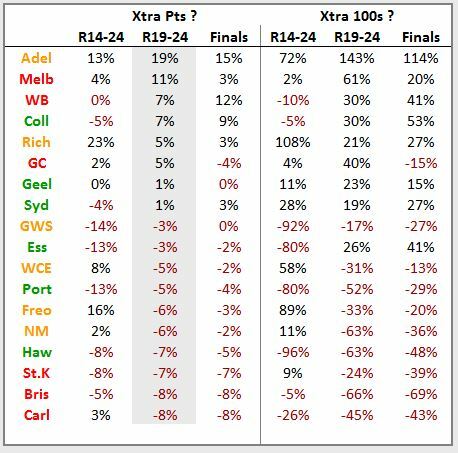 Handy guide especially when its line ball with some trades – we need to start to consider finals scoring (probability). Great stuff….. Thanks for response, glad you liked it. But with your avatar hardly surprising. Got Martin as my F6 and DPP with Thurlow if R1 or 2 goes down. I would think twice bout fielding him this week up against freo with sandlilands at pattersons stadium. I completely agree about Martin as F6 – at least until Leuenberger returns. The relevant year for Martin was 2011. Jamar et al got injured, Martin became the sole ruck, but continued to score well after Jamar came back until the infamous Geelong game (about 4 more matches as backup ruck). Prior to the Geelong game he averaged just under 99 over 10 games. After that, he, like the rest of Melbourne, was no good. Keep in mind that Melbourne were actually an ok team in 2011 until the Geelong game, entering the top 8 in Rd 14! The next year, he managed 23 pts in Rd 3 before being subbed and dropped so is capable of a shocker – at least he was in the rabble that was the 2012 Demons. He did then return later in the year for 3×100 in a row, but was then dropped after a couple of poor games sharing ruck duties with Spencer. The moral of the story is that he’ll score really well as sole ruck, but could either continue to score well or struggle after Leuenberger returns (assuming Leuenberger returns). Leuenberger’s listed as 3-4 weeks. Maybe this week is the exception against Sandi, however (as mentioned by Tigers). Great thanks for verification info Tim. To each his own re onfield selections. I’m comfortable that if Martin’s scores held up against Mumford they will hold up against Sandi. Martin’s scoring isn’t dependent on hitouts, he runs into space to create marks and gets to a lot of contests to get possessions and disposals. Martin is supposed to be a key forward, but he plays more like an old style ruckrover. The size of WA ground will suit him, Sandi won’t be able to keep up with Martin. There isn’t much point just standing defensively with Sandi as he is so big he will mark anyway, so I think Martin will do OK running around. Martin gets most of his points running into space and the bigger grounds should suit him. Will always get a few tackles and 10-20 hitouts as solo ruck, even against Sandi. Should be good for 80-100 which is better than most people’s F6’s at the moment. Good chance also that Brisbane won’t risk bringing back Leuy for only 4-5 weeks at the end of a year that’s already shot. They will want to get a clean pre-season into him for next year. Completely agree with the Martin paragraph. I have done the same thing i expect he will ave around 90 which would have him as one of the top 10 forwards and with Mcglynn injured Smith up and down and Dahlhaus not hitting the heights of earlier in the season his expected consistency should make him great pick in the forward line. Thanks for support. Good that we all agree. Hope it works out for us all!